@cloongc88 I believe first roll is only those on banner and they got the 5* on 2nd rolls. It's better to do 2 rolls then reroll your account. It not hard hard to get the 4 crystals for the 2nd roll. Ã§â¹ÂÃ¥Â¥Â³Ã¥Â¸ÂÃ£ÂÂ® Ã¥Â®Â£Ã¨Â¨â¬Ã¯Â¼Å¡Ã¥Â¤Â§ Ã£ÂÂÃ£ÂâÃ£ÂÅ*Ã£ÂÂ£ Ã£ÂÂ±Ã£ÂâÃ¦Åâ¬Ã©Â«Ë  ! I've seen people on BL roll 4 star starters on the first two rolls we get, so yeah. 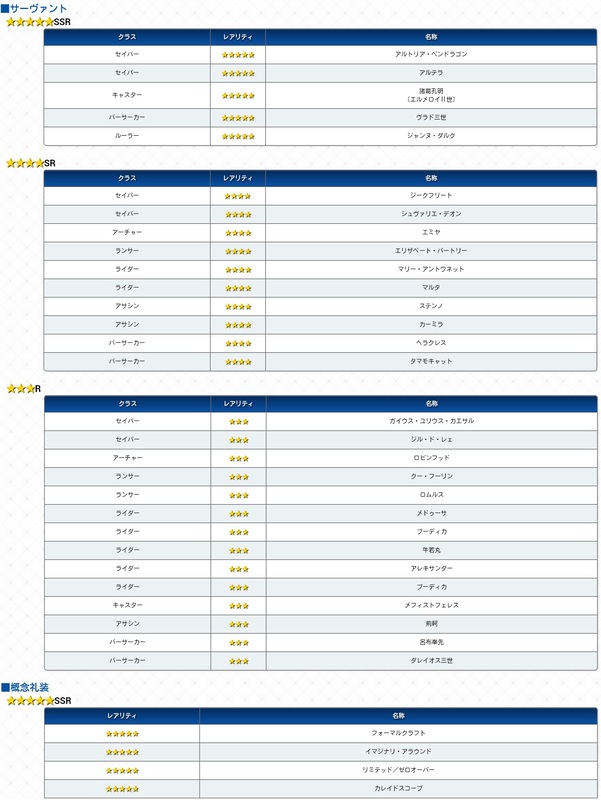 Also, I believe this is a list of all the 3star+ Servants that have been seen as of a few hours ago. Also, for people having trouble using qooapp, here's the .apk file. Isn't the game still down? @Senko Yeah reolling ccrashed their servers/. Yeah, this is just reposts of stuff that was reposted to BL from chinese and japanese forums before servers crashed. Whether or not this actually happens is anyone's guess.